In the opening minutes of When Marnie Was There, 12-year-old Anna (Sara Takatsuki; Hailee Steinfeld in the English-dubbed version) sits on a park bench, sketching. She's isolated—her classmates are giggling together while working on their own art projects—but it's not immediately obvious that there's anything particularly wrong with her. And then we see her begin to experience an asthma attack, as the voice-over narration by Anna lets us know what she's thinking: "I hate myself." Take a few minutes to ponder the last time you saw an animated film featuring a protagonist so deeply, bluntly troubled. If you can come up with one at all, it was almost certainly another Studio Ghibli film, because while the legendary Japanese animation studio has primarily made films about young people, it has almost never pandered to an audience it assumes is made up entirely of even-younger people. 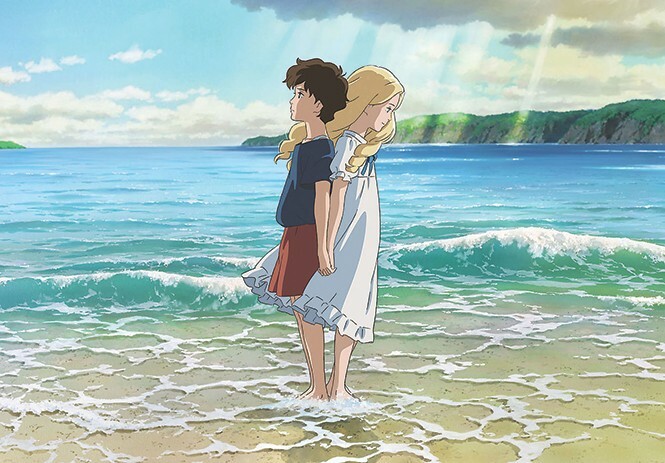 That's part of what makes the idea that When Marnie Was There may be the last Studio Ghibli feature ever—as founder Hayao Miyazaki indicated in 2013—so crushing. In America, we've been trained to think of animation as a genre, and a genre aimed almost entirely at children. When Marnie Was There is a reminder that animation is simply a way of telling a cinematic story—and that sometimes those stories can be awkward, painful, meditative and sad. Director Hiromasa Yonebayashi (The Secret World of Arrietty)—adapting Joan G. Robinson's 1967 novel—follows Anna as her foster mother, concerned about Anna's asthma attacks in the city of Sapporo, sends her out to a rural fishing village to spend the summer with relatives. There, while exploring, Anna discovers the Marsh House, a glorious mansion that appears to be long-deserted. But Anna begins seeing a girl in a window of the house, and eventually meets and befriends the girl, named Marnie (Kasumi Arimura; English voice by Mad Men's Kiernan Shipka)—though it's not clear if she's real, a dream or some kind of ghost. As has been true through decades of features from Studio Ghibli, there's a gorgeous level of detail in the animation Yonebayashi builds into Marnie. When Anna looks around the room in which she'll stay at her aunt and uncle's house, we get just a glimpse of a cat carved into a window seat by a now-grown previous inhabitant. Grass ripples slowly in the breeze, providing a physical texture to this world. When Marnie Was There may be far less overtly fantastical than Ghibli classics like My Neighbor Totoro or Spirited Away, yet there's something just as fascinating about the way this movie invests care into the simple movement of shorebirds and Anna's tense body language. And Anna really is what makes Marnie such a wonderfully heartbreaking story. Yonebayashi refuses to make her "troubled" in the timid way we might expect from a conventional modern animated film. She's filled with that self-hate as a result of what she knows about how she came to live with her foster mother—and also by what she doesn't know—and those emotions manifest themselves in behavior that's sometimes cruel and unpleasant, like when she lashes out at a local girl. Her moods swing wildly as she latches on to her vaguely magical friendship with Marnie—who has her own difficult relationship with her parents—in a way that adolescent girls often cling to the life raft of their best friends. It's an honest, rich story about the emotional volatility of a young girl, and it just happens to be a story that's told through animation. When Marnie Was There does suffer from a tonal sameness throughout the material. Lacking the kind of fanciful set pieces characteristic of other Studio Ghibli features, it rides almost entirely on the highs and lows of Anna's own emotions, while generally feeling restrained even during the moments of upheaval and revelation. As finely crafted as it is, it's a character study that doesn't invite you into the wildly imaginative places you might expect. But perhaps, in a way, that makes it even more of a perfect—and tragic—farewell to what Ghibli brought to feature animation. Without funny sidekicks, frenzied pacing or musical numbers, their films had to be human stories. We'll miss them when they're gone.